The decision is made! I've chosen the yarn for the new sweater (the one on the cover of Vogue Knitting Spring/Summer 2008) but it isn't what I thought it would be. I've chosen a Reynolds yarn called Soft Linen in the most gorgeous shade of ice blue. I'm hoping to have this sweater completed by the time I leave for Greece at the end of April. As I'll be spending a few days in Washington, DC, before my flight, I do have some wiggle room. 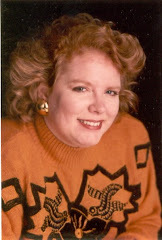 First, I'm thinking about making this sweater one wave repeat longer than it is shown on the Vogue Knitting cover. Personally I don't like sweaters that hit exactly at the waist - at least not on me - so I have to dig out the tape measure to make sure this is what I want to do before I jump into editing the pattern. And second, I'm going to make those sleeves a bit longer. It will be difficult to wear a t-shirt under it if the t-shirt arms are sticking out! Since I plan to take mostly t-shirts with me on the trip, this lengthening of the sweater's arms is a must. I have found my next project! 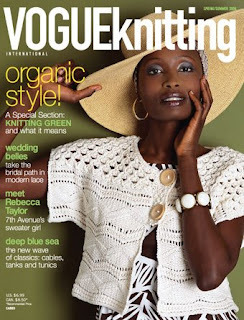 The sweater on the cover of Vogue Knitting magazine - Spring/Summer 2008 - will be the next project I start. Instead of using the yarn featured, however, I'll probably do this in a Berroco yarn. Perhaps Cotton Twist, Touche, or Love It will work. I'm heading over to The Busy Needle in about 20 minutes and will check the gauges on the ball bands and then make my choice. More after I make up the gauge swatch! Yesterday I had to restart a sweater. The gauge swatch matched, but when all the stitches were on the needles it started to stretch width-wise and became much wider than it should have been. Fortunately I'd only knit about 4 inches (2 skeins!) of it before ripping it all out. I've reknit one skein of the yarn, I can already tell it's much better. It doesn't stretch nearly as much and should be okay now. I went down two needle sizes, but it still is on gauge. Go figure. It obviously was supposed to be blocked open (and I let the yarn relax) when I measured the original gauge swatch. While I wouldn't call this a lace pattern, the open yarnovers made the difference. Grrr... I hate ripping. I'll post a photo at the end of this weekend (which is Monday for me) so you can see the progress. While I do take my time finishing some projects, there are others that just call to me to finish quickly. Marilyn Leavitt-Imblum's Angel of Hope was one such project. She was completed, framed, and shipped off to a friend in California about a year ago. She only took 6 months to stitch and I was working on other WIPs for the shop at the same time. I've included a photo of the finished piece here, with a slide show of her progress at the bottom of the page. Hopefully you can see that I chose reds for her hair, instead of the browns suggested in the chart. Kim (framer extraordinaire at the shop) did a fabulous job in the framing of this piece. Her choice of suede mats with this frame set off the piece exquisitely. I think this piece would be stunning if I changed her hair to a lighter red, and made the gown's sash a Irish grass green. I will do this one again in those colors..... someday. When Do I Have the Time? That's a very good question. I usually tell people I have some free time during my day... usually between 4-5 am, but I'd prefer to sleep! On a more serious note, I often have multiple projects going at once. Last I counted I had 14 cross stitch pieces in various stages of completion. As soon as the beading is complete on Earthdancer, I have another piece that is ready t o go on the frame. 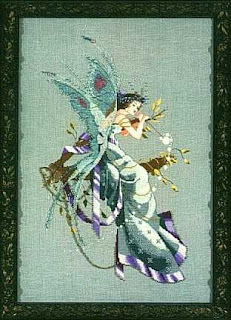 Mirabilia's Midsummer Night's Fairy is already stitched and awaiting its beads. 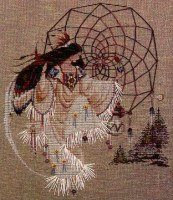 I stitched this piece on a white linen background as I didn't feel the blue depicted on the chart did justice to the design. On white, the fairy and tree branch on which she sits just pop off the page. I'll post a photo of my work as soon as I take one. All of the charts for the pieces on which I'm working are available for sale at The Busy Needle shop as well as on The Busy Needle's website. Please visit us anytime! You can even shop online in your jammies. After searching for the chart photos for the above pieces, I realize I underestimated the number of works-in-progress that I have going. I'll clue you in to the actual number later when I've taken photos!